Wall Street has a major crush on cryptocurrency markets that it just can't seem to get over. Stock investors look upon the massive gains earned by early Bitcoin and Ethereum investors with envy. They see the value in blockchain technology and distributed ledgers and want to get in on the action before the markets have fully priced in the impact that cryptocurrencies will have on the economy. While most investors won't put in the effort to open up an account with a private cryptocurrency exchange like Binance or Coinbase, there are still plenty of opportunities to get exposure to cryptocurrencies in the public markets. Don't be fooled though. Publicly-traded companies know their stock price will skyrocket if they make a blockchain announcement, so companies like Long Blockchain Corp (formerly Long Island Ice Tea Corporation) are making spurious pivots into Blockchain technology to ride the hype train. Does anyone really think that an Ice Tea company will become a major player in cryptocurrency markets? Bitcoin is mined using high-end specialized hardware packages called ASICs that perform no other function than mining Bitcoin. Creators of newer cryptocurrencies like Ethereum and Dash wanted to make it so that everyone could mine cryptocurrencies, not just centralized mining facilities with specialized hardware in parts of the world with cheap electricity. They changed their hashing algorithms so that anyone with a modern computer and graphics card, like those made by AMD and Nvidia, could mine their coins. AMD's Radeon graphics cards are preferred by cryptocurrency miners because they offer superior hashing performance to those produced by Nvidia. 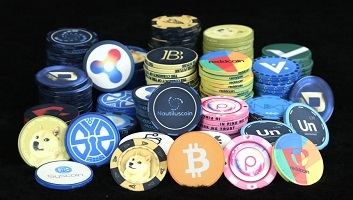 By targeting their products toward miners, they have significantly expanded their potential market size by creating products that can be sold to high-end computer gamers and to cryptocurrency miners. There are plenty of other reasons to like the company as well. AMD's revenue is now steadily growing again after years of not being able to compete with rival Intel. Analysts keep raising their price targets on the stock and their financials are looking better quarter-by-quarter. Advanced Micro Devices, Inc. operates as a semiconductor company worldwide. The company operates in two segments, Computing and Graphics; and Enterprise, Embedded and Semi-Custom. Its products include x86 microprocessors as an accelerated processing unit (APU), chipsets, discrete and integrated graphics processing units (GPUs), and professional GPUs; and server and embedded processors, and semi-custom System-on-Chip (SoC) products and technology for game consoles. The company provides x86 microprocessors for desktop PCs under the AMD Ryzen, AMD Ryzen PRO, Threadripper, AMD A-Series, AMD FX, AMD Athlon, AMD Athlon PRO, and AMD Pro A-Series processors brands; microprocessors for notebook and 2-in-1s under the AMD Ryzen processors with Radeon Vega GPUs, AMD A-Series, AMD Athlon, AMD Ryzen PRO, and AMD Pro A-Series processors brands; microprocessors for servers under the AMD EPYC and AMD Opteron brands; and chipsets under the AMD trademark. It also offers discrete GPUs for desktop and notebook PCs under the AMD Radeon graphics and AMD Embedded Radeon brands; professional graphics products under the AMD Radeon Pro and AMD FirePro graphics brands; and Radeon Instinct accelerators for servers. In addition, the company provides embedded processor solutions for interactive digital signage, casino gaming, and medical imaging under the AMD Opteron, AMD Athlon, AMD Geode, AMD Ryzen, AMD EPYC, AMD R-Series, and G-Series processors brands; and customer-specific solutions based on AMD's CPU, GPU, and multi-media technologies, as well as semi-custom SoC products. It serves original equipment and design manufacturers, datacenters, original design manufacturers, system integrators, distributors, and add-in-board manufacturers through its direct sales force, independent distributors, and sales representatives. Advanced Micro Devices, Inc. was founded in 1969 and is headquartered in Santa Clara, California. Ratings Breakdown: 15 Buy Ratings, 10 Hold Ratings, 2 Sell Ratings. Many of us think of International Business Machines (IBM) as a relic of times past. They no longer produce personal computers and largely sell specialized technology service to Fortune 500 companies. This might not be exciting to most, but IBM has been able to introduce and scale new technologies into the Enterprise like no one else. IBM is now focusing on democratic applications of the blockchain, allowing its customers to create networks, setup governance rules, invite members into the network and validate transactions. It has launched a consultancy for blockchain technologies teaching companies how to best use the technology and create their own blockchain networks. It has also launched a "blockchain accelerator" program to help guide businesses through the technical and legal ramifications of running blockchain networks. IBM has also launched an open-source collaboration initiative called Hyperledger that hopes to expand the use of the blockchain in all industries. Hyperledger already has more than 130 member companies in industries spanning financial services, manufacturing and technology all working together to create a distributed ledger framework that is standardized and open. The markets have been kind to Overstock (OSTK) for the last several months, primarily because of its growing focus on cryptocurrencies and blockchain technology. One of its divisions, Medici Ventures, has quietly been working on blockchain technologies for the last three years. According to its website, Medici focuses on “six key areas of emerging crypto-industries” — capital markets, money and banking, identity, land, voting and underlying tech. Overstock has a a number of portfolio companies dedicated to working on blockchain technology, with tZero being the most prominent. TZero will soon be launching an initial coin offering (ICO) to fund the development of SEC-compliant trade tokens as an an alternative to traditional financial markets. Overstock.com, Inc. operates as an online retailer in the United States and internationally. It operates through Retail and tZERO segments. The company offers furniture; and home décor, including rugs, bedding and bath, home improvement, kitchen items, and other related products. It also operates Worldstock Fair Trade, a store that provides handcrafted products; Pet Adoptions, a free service and portal to display pets available for adoption; and Overstock Hotels, a portal that enables customers to search and book properties within its Website. In addition, the company operates Supplier Oasis, a single integration point for partners to manage their products, inventory, and sales channels, as well as obtain multi-channel fulfillment services through its distribution network; and offers businesses advertising products or services on its Website. It provides its products and services through its Internet Websites, such as overstock.com, o.co, and o.biz. Further, it focuses on the development and commercialization of financial applications of blockchain technologies. The company was formerly known as D2-Discounts Direct and changed its name to Overstock.com, Inc. in October 1999. Overstock.com, Inc. was founded in 1997 and is headquartered in Midvale, Utah. Ratings Breakdown: 3 Buy Ratings, 0 Hold Ratings, 0 Sell Ratings. Square (SQ) could be the first established payments company to fully integrate Bitcoin technology into their payments platform. Square helps small business owners around the globe accept credit cards through point-of-sale systems and mobile card readers. Business owners might flock to the platform if they become the company that allows them to easily and seamlessly accept Bitcoin. Just about every business owner in the world wishes they had bought Bitcoin five years ago, and owning some that the receive as payments for their business will help business owners feel like they're part of the cryptocurrency mega-trend. Square CEO Jack Dorsey has previously called blockchain the "next big unlock" and the company is actively testing Bitcoin payments in its marketplace app, Square Cash. If Square becomes the company that makes it easy to buy Bitcoin and use it for payments, it could benefit from a first-mover advantage and generate significant fee revenue from people using their platform to buy and sell the cryptocurrency. Square, Inc. provides payment and point-of-sale solutions in the United States and internationally. The company's commerce ecosystem includes point-of-sale software and hardware that enables sellers to turn mobile and computing devices into payment and point-of-sale solutions. It offers hardware products, including Magstripe reader, which enables swiped transactions of magnetic stripe cards; Contactless and chip reader that accepts EMV® chip cards and Near Field Communication payments; Chip card reader, which accepts EMV® chip cards and enables swiped transactions of magnetic stripe cards; Square Stand, which enables an iPad to be used as a payment terminal or full point of sale solution; and Square Register that combines its hardware, point-of-sale software, and payments technology, as well as managed payments solutions. The company also provides Square Point of Sale software; Cash App, which provides access to the financial system, allowing customers to electronically send, store, and spend money; Caviar, a food ordering platform for restaurants to offer food ordering, pickup and delivery, to their customers; and Square Capital that facilitates loans to sellers based on real-time payment and point-of-sale data. Square, Inc. was founded in 2009 and is headquartered in San Francisco, California. Ratings Breakdown: 20 Buy Ratings, 12 Hold Ratings, 3 Sell Ratings. Microsoft's (MSFT) Azure cloud computing arm hopes to offer the first mainstream blockchain solution to enterprise businesses. The company is now selling new distributed ledger infrastructure and offering several different blockchain apps for companies to create their own cryptocurrency networks. Ratings Breakdown: 27 Buy Ratings, 2 Hold Ratings, 1 Sell Ratings.